1. White kitchens stand the test of time, always remaining in style. 2. White is the ultimate neutral, since every color looks great paired with white. 3. White evokes a positive emotional reaction. 4. White reflects light and makes a small kitchen seem more spacious. White continues to top the list of favorite colors for kitchens. A white kitchen never looks dated. Additionally, every color looks good when paired with white, even other neutrals like gray, beige, and black. Not only does white appeal to the eye, but it also is emotionally appealing, since white looks clean and fresh and represents purity; white is a happy color. White walls, cabinets, and countertops reflect both interior and exterior light, making even the smallest kitchen appear larger. When you decide to sell your house, a white kitchen will help make it attractive to buyers. White comes in many different shades – chalk white, milk white, antique white, flat and glossy whites. Additionally, there are warm whites, those with yellow/green undertones, and cool whites, those with blue/grey undertones. Warmer whites will appear darker; cooler whites will appear lighter. It is important to keep these variations in mind when choosing trims, accent colors, and accessories. Different materials can affect the way the same color of white appears. For example, the same shade of white on dark wood cabinets will appear a bit darker than it does on stainless steel appliances. A high-gloss lacquer on cabinet fronts or floors will have a reflective finish, taking on the hue of whatever other colors you choose as trim or accents. Give your kitchen personality by adding texture. The weatherworn look, a slightly distressed white finish on kitchen cabinetry, is particular charming. White subway tile is affordable, timeless, and adds texture and light. A geometric pattern – such as herringbone for a backsplash – works well in an all-white kitchen. Try cupboard valances with carved gothic details. Breadboard adds ceiling texture. Do not forget your floors. Black granite floors ground the kitchen, colored tile adds drama, and wood adds warmth and natural beauty. Carrara or Callacatta marble are similar-appearing Italian marbles, white with gray veins. Carrara tends to be grayer with softer veining, and Callacatta is a brighter white with bolder, more dramatic veining. This marble with gray blotches and veining pairs well with stainless-steel appliances and nickel hardware. Save money by choosing laminated or engineered quartz countertops. Choose a creamy white, and gold-tone engineered quartz for a rich, mellow look. 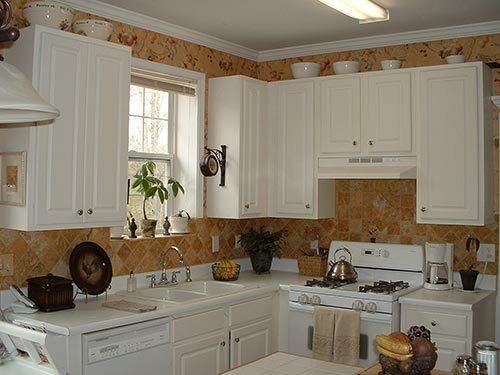 It is simple to change the look of your all-white kitchen: simply change the color of accents, trim, and artwork. If you have a modern-style kitchen, use recessed lighting to highlight work areas. Deep grays, blacks, and dark navy blues create a sophisticated, modern appearance. Use it with fresh greenery or a few pops of bright primary colors. For a country-style look in your white kitchen, use antique drawer pulls. For a soft, fresh feeling, use pastel greens, blues, and yellows for trims and accents. Consider café curtains in a small floral print. Intricate decorative molding adds interest at the ceiling. Since white creates a blank canvas, use unique furniture to add interest. Cover stool seats with vibrant upholstery. Look for vintage chairs and other thrift-store finds to add personality. Hang a colorful plate collection on one wall, or hang colorful pots, pans, and cookware on pegboard painted white. One challenge with a white kitchen is keeping it from looking washed out. In choosing lighting for your white kitchen, keep in mind the need to highlight areas of interest and create shadows to provide visual interest. Hang lights over islands and eating areas. Use recessed lighting under cabinets to highlight counter areas. Place lights to reflect off shiny surfaces in areas where detailed work, such as reading recipes, is necessary. White kitchens offer homeowners many benefits. Whenever you want to change the look of your kitchen, all you need to do is make some changes in lighting, accessories, and accent colors. The look never grows old, and it makes your kitchen comfortable for you and an asset if you decide to sell your home. You really cannot lose if you choose white for your kitchen.